At Mobile World Congress this year, Panasonic demonstrated a glass that can be turned into a display in an instant. The solution relies on a thin film between the sheets of glass that can quickly change its properties when electricity is supplied, allowing a rear projector to focus and provide an image. The system is currently aimed at retailers that want to attract more attention to their stores and shelves. The company says that the first deployments of the technology are expected this spring. There are typically two ways for stores to attract the attention of those passing by. 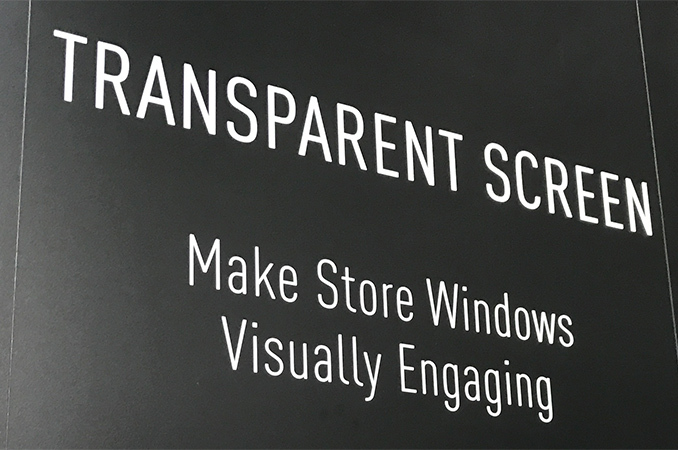 Either put something interesting in the shop window, or replace the window with LCD screens that showcase something appealing. 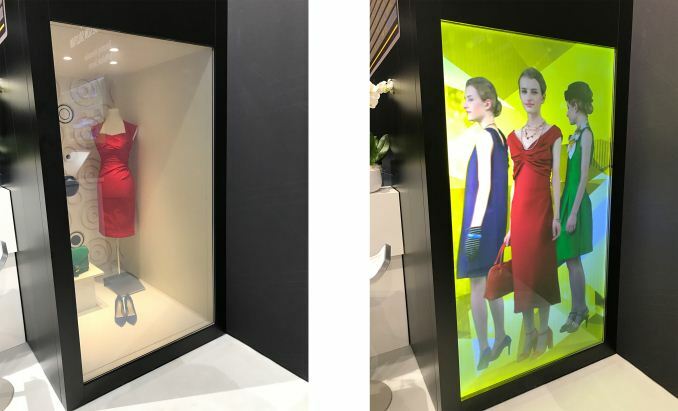 The new solution that Panasonic is showing blends traditional showcases and displays, enabling owners of stores to have both. 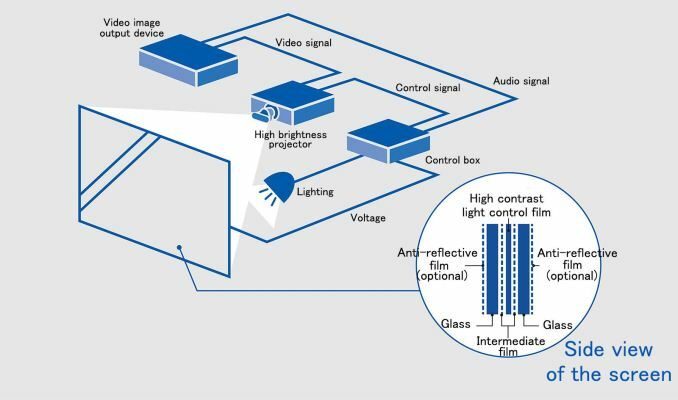 The technology behind the solution appears to be relatively simple: Panasonic takes two glasses and puts a special light-control film between them. The film is matte and can be used to display images that are projected onto it using a conventional off-the-shelf projector. But when electricity is applied to the film, it becomes transparent. Similar opaque glass technologies are in frequent use, applying a potential difference across two electrodes embedded in the glass and between an electrolyte whereby larger particles in the electrolyte self-assemble in the presence of an electronic charge to allow light to pass through. This ends up being a natural extension of what Panasonic has shown at other recent events regarding large glass projection display technology. 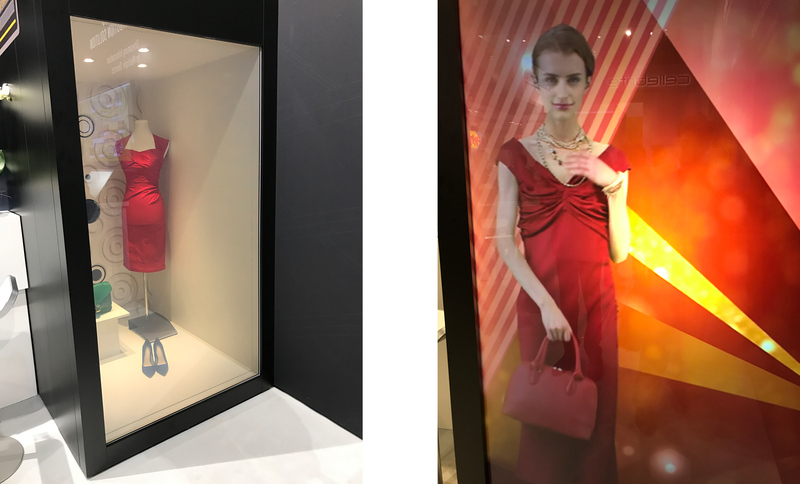 At MWC 2017, Panasonic showed a booth with a mannequin wearing a red dress, a pair of black shoes, a green handbag. The lens of the projector was camouflaged with the environment. Once the film is “switched”, the 1×2 meter window can be used as a screen and this is where Panasonic is demonstrating a video with a model wearing that exact red dress (albeit, with red shoes). The manufacturer says that the resolution of the display depends entirely on the resolution of the projector, but the density of the non-transparent particles as well as the placement of the projector have its effect on the quality too. Meanwhile, since the videos are displayed using a projector, it should not be too hard for stores to set everything up for transparent screens. Panasonic does not reveal the tech behind its smart glass and as there are multiple types of films that can change their properties when electricity is applied, which makes estimating difficult without an official announcement. What is important here is that the glass can either be a screen, or completely transparent. So, unless you stick several glasses together, the window will be either a window or a display, which limits the number of applications that can use the tech. At present, a 1×2 meter wall (XC-CSG01G) is the maximum size of Panasonic’s “transparent screen”, so, if someone wants a larger wall, they have to use several glasses and projectors in sync. The total cost for a single 1×2 meter display with a control box (XC-CSC01G-A1) like this will be around $3000-$4000 according to a Panasonic rep at the booth (not sure if this includes the projector, it doesn't sound like it does, but that price is minus a support contract). Panasonic states that the company already has customers interested in these products and are basically ready to accept delivery. The high price of Panasonic’s transparent screen glass is conditioned not only by its capabilities but also by the fact that everything has to be rugged and work properly for different weather and temperatures. 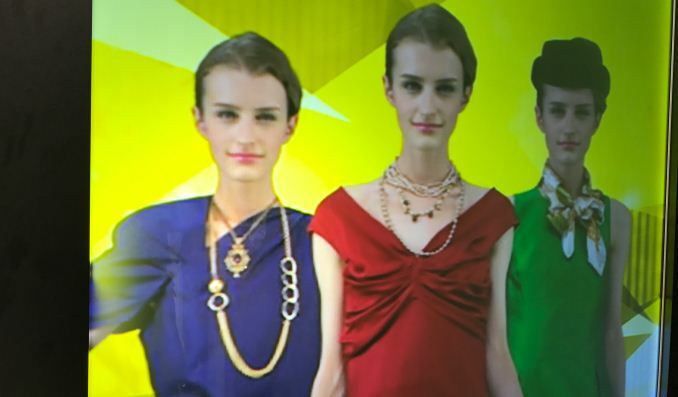 Panasonic plans to start selling its “transparent screens” in Japan first and then look for customers in other parts of the world as well. We're pretty desensitized to moving images at this point. I'm not sure something like this will translate into increased foot traffic and sales. Bah, should have used NT or Linux! I remember when we dual booted with Win 9x (can't remember which one) and Win 2K. The former was for gaming as the drivers never worked properly in 2K and the later was for work when we wanted to type more than a sentence in Word without it crashing. Despite the massive improvement in stability and the autosaving and document recovery, the habit of pressing "CTRL+S" after every few sentences or every good idea remains intact. MS, I can never trust you.